I bought this off ebay the other day and thought I’d share a few pics with you. 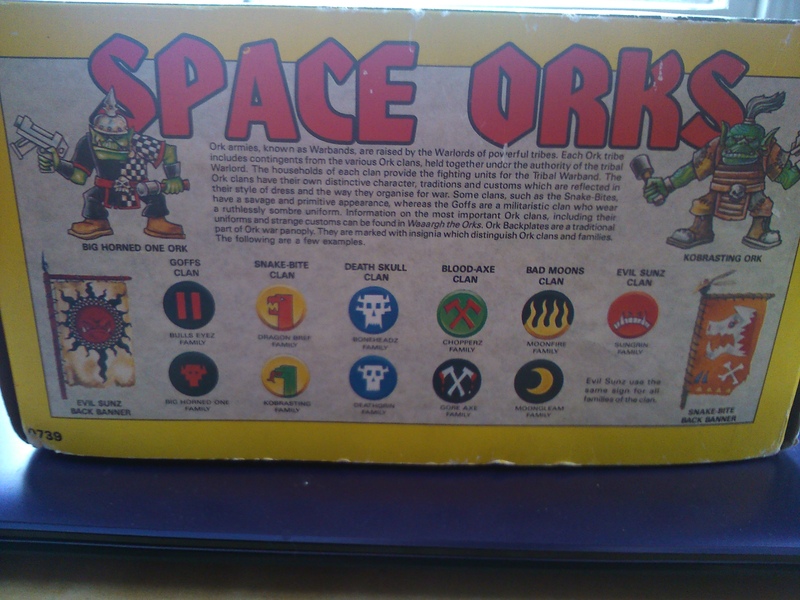 This is, of course, the plastic Space Ork boxset. 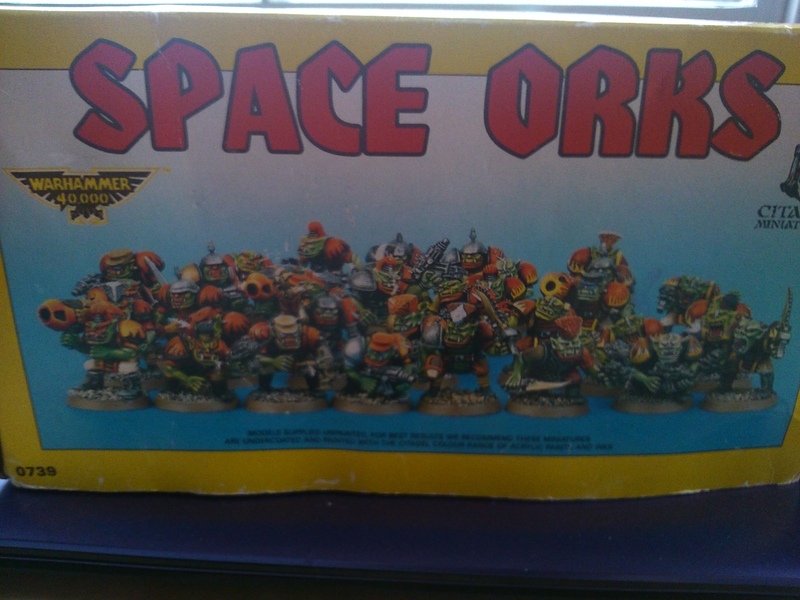 My ostensible reason for buying it was that it had lots of half used sprues and I’m always on the look-out for old Ork arms and weapons at a reasonable price! But the lure of the cardboard box helped too. I think I bought a few of these when I was a kid. 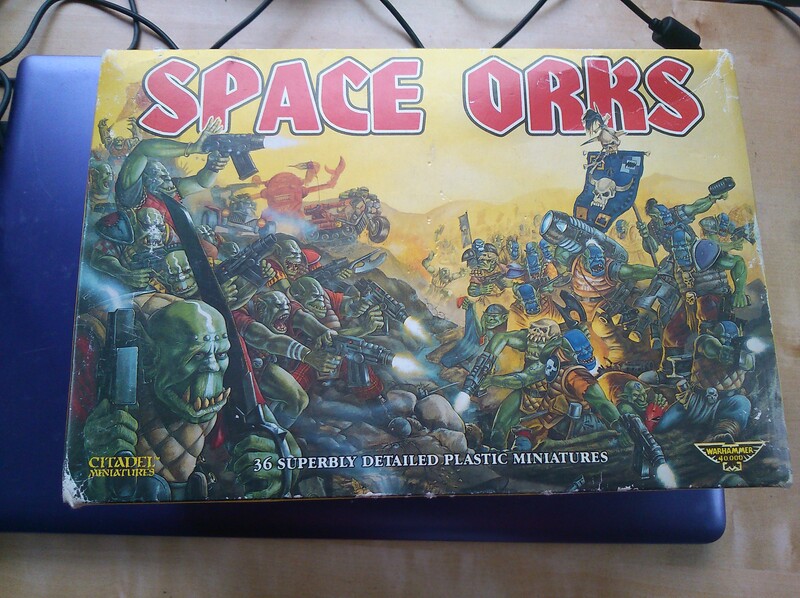 Much better value than the lead miniatures, though to my adult mind the plastics aren’t anywhere near as good. I’m painting a couple at the moment and they’re not as fun to paint. Because they’re not as detailed they’re actually more challenging to paint well (especially for someone like me whose still an enthusiastic amateur). Still, they were dead cheap and enabled you to bulk out your squads really well. 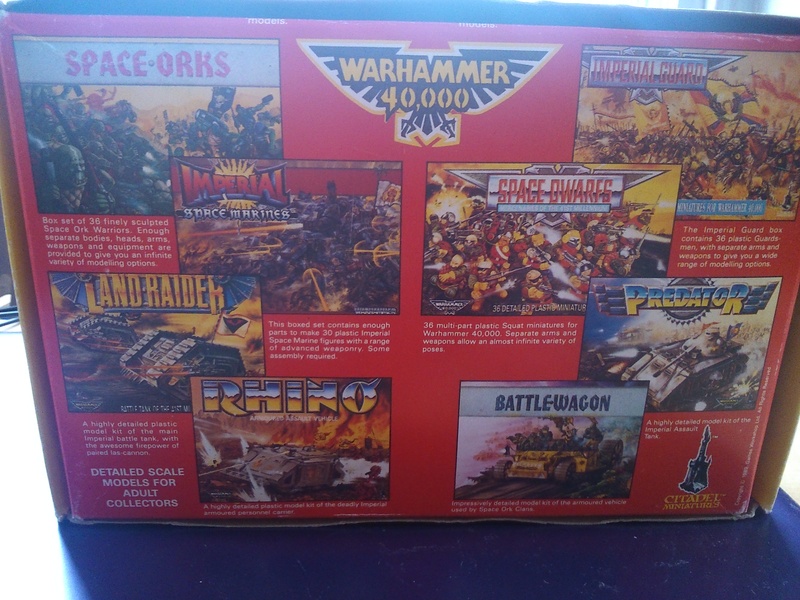 they contained more weapons and arms than you needed so you had spares for your bits box, and the sprues were full of pouches, grenades, armour, spades, binoculars and all sorts of things that you didn’t really use but were considered essential to the full experience. Enjoy the pics of the packaging! Having finished painting a load of stuff yesterday (pics to follow), I’ve reached into The Pit (aka The Big Box Of Models) to see what happens next. An overpainted Ork Freeboota Kaptain? Into the dettol with you! A plastic marine with a sword? Good for me! This means that the next painting job will be a Space Marine Assault Squad. I root through the box until I’ve got ten marines that have assault weapons or no weapons at all. Below is a picture of all ten in their beginning states. A couple will immediately join the Ork in the dettol though! 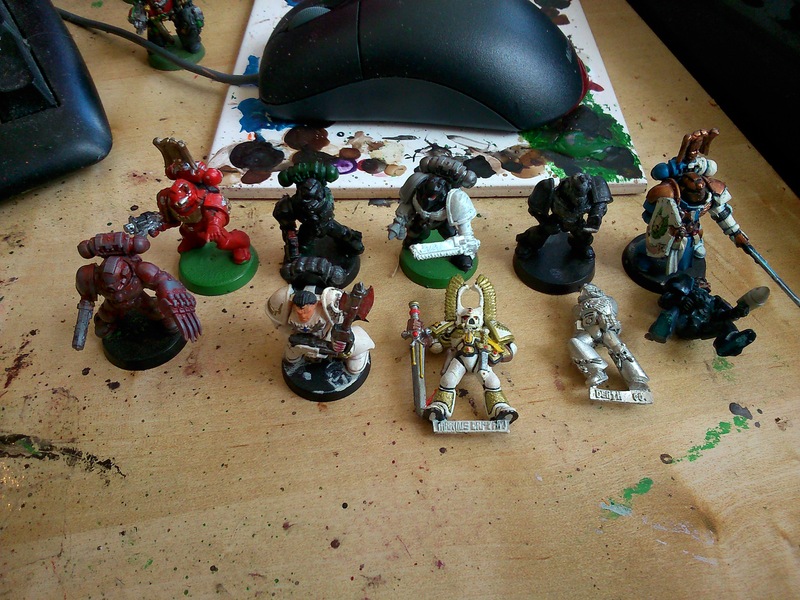 As you can tell, I buy my miniatures from ebay! I love poking through a box of old miniatures, seeing what gems are there or looking at other people’s wild conversions. Because I want a whole chapter of Space Marines one day there’s not really any other way of doing it. In this batch there are 6 modern plastic multipart marines, 1 RTB01 marine, a metal death company marine, a Space Crusade captain (with a home-made paper cloak that i think i will keep), and an RT Dark Angels Marine Captain. You’ll next see these guys when I’m done painting them! I like the mix and match nature of having different eras of marine in the same squad. I like the idea that sporadic rearming, damage to armour, deaths and promotions etc mean that squad armouring is in regular flux and therefore it is the squad markings and paintjobs that indicate a squad, not the armour mark or styles. 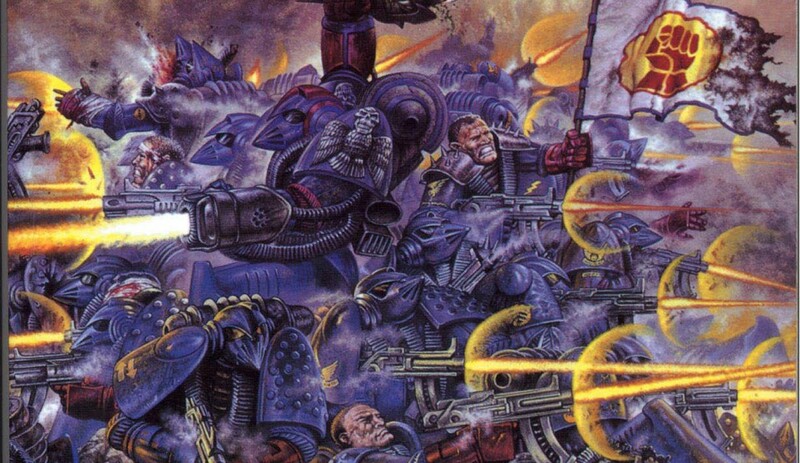 Also, because the Steel Guard don’t have a homeworld and recruit as they go, there will be marines from dozens of different cultures within them, hence a variety of styles of personalisation. Let’s hope they’re not too individualistic though, I can’t imagine the Inquisition would have anything good to say about that….